Creating Fence Designs & Projects for you or working with your designs, your material, your general contractor, your IDEAS, is WHAT WE DO!!! Call us if you need to install any new, used, old, broken down, shabby, ancient metal, iron, steel, rock, brick, stone, wood Fence, Door, Gate, or any other type of Fence you have or want to have. 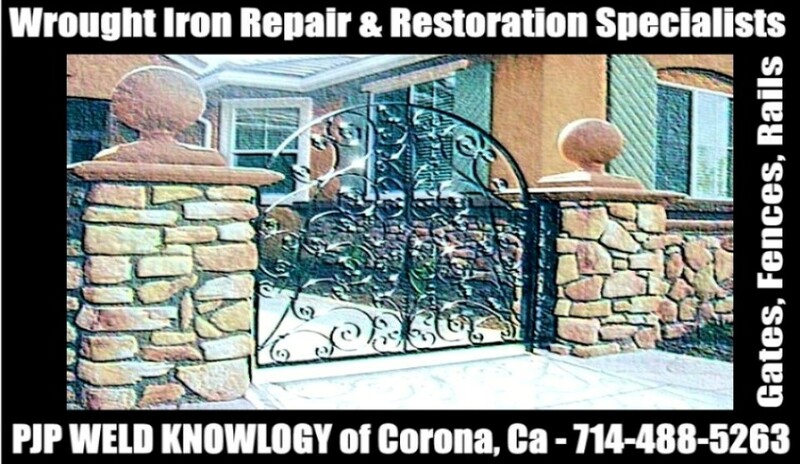 Corona Fence can and does sell new & custom fencing solutions to the entire Southern California HomeOwner Market. Yet we only extend our guarantee to a radius of 30 miles or less. Secure a vacant property call us. If you need us for any of the following, please, PLEASE, CALL US!!! Se habla Espagnol, and WE LOVE JESUS CHRIST. Thank you for your time & we hope to serve you soon. Copyright 2014. PJP Weld Knowlogy of Corona - Pedro Jacobo. All rights reserved.